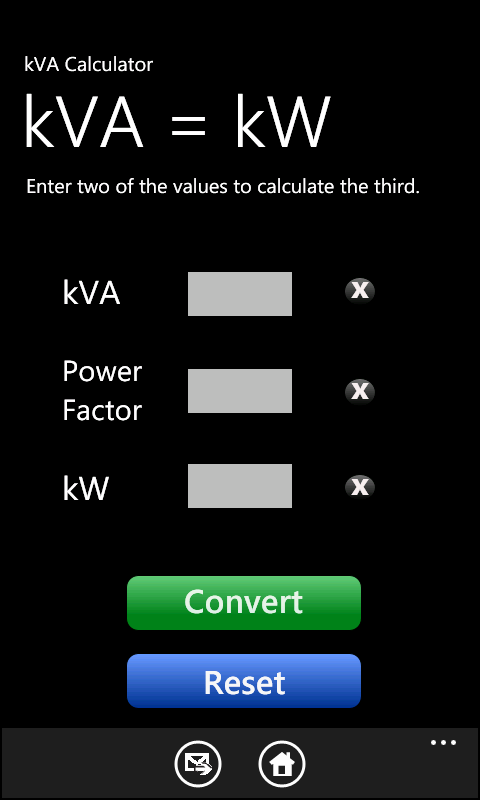 kVA Calculator for Windows 7 Phone & iPhone, iPad, iPod, WP7 - OUT NOW! Aug. 20, 2011 - PRLog -- Calculate either the kVA, kW, Amps, Volts or Power Factor using the other known values, Single and Three Phase calculations. There is also a settings page where you can set and save your default Volts and Power Factor values if you wish too, therefore no need to keep inputting the Volts or Power Factor values as the saved default values does this for you. You can also email us from the Info page with any enquires or suggestions. - Convert to or from kVA, KW or Power Factor . - Convert to or from kVA, Volts or Amps. - Save Default Volts & Power Factor Values. - Email us from the app info page. - Single and Three Phase Calculations. We design and build native & web based software applications for mobile devices, tablets and computer software mainly for the electrical & engineering sector.